Hello all! I'm looking for various minifigures from The Hobbit and The Lord of the Rings . I have various Castle (Fantasy Era), Star Wars (celebration Luke, etcetera), CMF (incl. Spartans & Hazmat) and miscellaneous figures that I would be willing to trade . but you can offer any LOTR and castle parts and I'll see if I would like to have them, if you don't feel like browsing through this entire thing. The picture should cover most things, though. - Gandalf the White ! - Mouth of Sauron (Preferably with horse) ! - Pirate of Umbar ! - Ghost soldiers (AMAP) ! - Uruk-hai (Preferably fully armoured with weapon and shield, White Hand Uruks are welcome too) (AMAP) ! - Uruk-hai Berserker (AMAP) ! - Moria orcs (AMAP) ! - Ringwraith (Preferably with horse) (x7) ! - Rohan soldier (Several) ! - New mold horses ! - Grey Warg (AMAP) ! - Brown Warg (AMAP) ! - Goblins (Goblin Town set, all 3 are wanted) (AMAP) ! - Elrond (Armoured, Witch-king Battle - Legs & torso only would be preferred) (AMAP) !! - Witch-king (Witch-king Battle) (x8) ! - Hunter Orc (Attack on Laketown variant) ! - Gundabad Orc (Dol Guldur Ambush variant, preferred with hair, armour version wanted too) ! - Gundabad Orc (Battle of Five Armies variant) ! Shoot me an FM if interested! I would like to finish trades as soon as possible, and we must both have a clear list of what we're sending each other in the end. This is to avoid problems I've encountered and learned fom before. By trading with me, you agree to be willing to ship first, which can be negotiated in some cases. Bump. 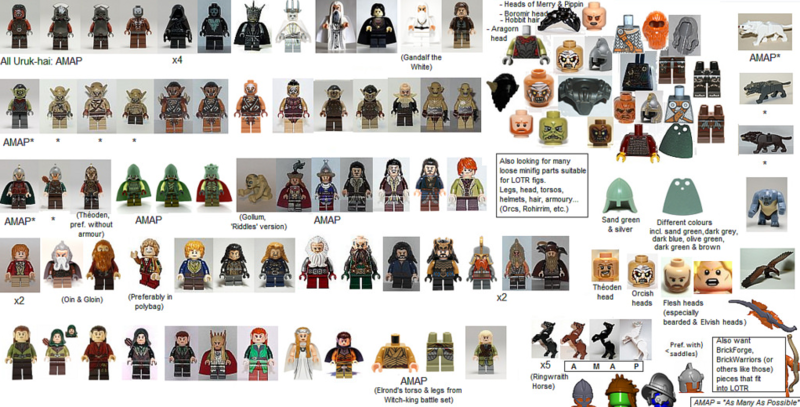 Now only looking for the listed Middle-Earth figures, figures that I need the most have been marked with "!". Would also like BrickWarriors items and monster/alien heads, pieces from Altbricks, as well as many different kinds of flesh heads. Bump again. Still looking for everything listed. 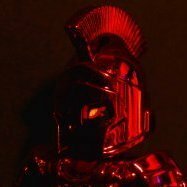 Now willing to trade a few more of my spartans as well as one hazmat guy, for good offers. Anything else you'll have to ask about, but I also have a good amount of 2007 fantasy era castle figures. Hi. I have plenty of hobbit and lord of the rings minifigures, you can pm me for details. It seems you can't use the PM system. You'll have to do 8 more posts. I'm pulling this topic back up, because I'm still looking for LOTR figures. Many of the existing LOTR figures and many of the ones from The Hobbit are welcome.